The thing we worked hardest on this quarter was launching our brand-new FREE Discovering Entrepreneurship Course. This class is for everyone, from self-advocates, to parents, to service providers, and is a way for everyone to explore more about entrepreneurship. We did a soft-launch in November in honor of National Entrepreneurship Month with the hope of pushing out the course to the masses in early 2019. I created a brand-new curriculum for this course with my brother Brent. He is the instructor of the class, and the curriculum process was a true collaboration between the two of us. It is so cool to see him share his experiences as an entrepreneur, his perspective is so unique and insightful! Be sure to check out the course here. We also launched our 2018 Celebrate the Season campaign. We kicked it off in style with a MATCH for all donations given to Celebrate EDU on #GivingTuesday (up to $7,500) and hit our goal, making it our most successful #GivingTuesday to date. We also hit our overall campaign goal of $25,000 thanks to more than 55 generous donors. We are so grateful for the support this holiday season! Last, but certainly not least, the big accomplishment to end an amazing year was that our video The Celebrate EDU Story (that we created in March for my 30th birthday) WON the “Most Moving Video Award” at the Reel Impact Film Festival in San Francisco, CA. Let me backtrack just a little bit, we created this video with Michael Miller of Sun Prairie Films in March. 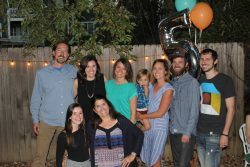 For my 30th birthday, I asked my friends and family to share it. Thanks to the hundreds of shares, the team at One World saw it and included it in the 300 submissions to the film festival. After a few rounds of judging it was chosen as one of the 19 finalists. Of course, we had to attend the festival, I mean when else are we going to be a film festival finalist? Sitting in the audience, we were completely shocked to be named the “Most Moving Video”. It was an absolutely surreal moment that I am so happy I got to experience and share with my family. What an amazing way to end an incredible year at Celebrate EDU. 2019, here we come! I am so excited to see what this year has in store for us. Some of the cool things we are working on for Quarter 1 are the launch of our “Resources” page on the Celebrate EDU site. This is an idea that we’ve been working on for a while and we’re thrilled to launch it in 2019. 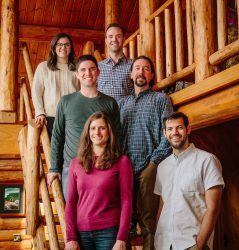 This section of the site will feature more stories of students who have participated in our programs and will offer valuable resources for those interested in learning more about business and entrepreneurship. Stay tuned! We are also hosting our first-ever virtual partner trainings in both our Kindling Workshop and The Spark Program. We are always looking for like-minded organizations who want to run our programs. If that’s you, click here to share your interest. Here’s to another exciting year! I look forward to celebrating all of our accomplishments with you all. We moved! Our new space is AMAZING but oh my god, remodeling an office and moving in 30 days is not an easy feat. 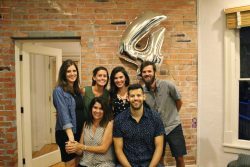 We went from a 350-square foot shared office, to a 1,400 square foot space. The house has been an office for years but it hadn’t been updated in a long time (1980s anyone?) We took over the place on July 1st spent the entire month redoing every single surface. I am not exaggerating. . . Gone are the brown shag carpet, fluorescent lights, and lavender walls, it now looks totally modernized. We replaced the floors, painted all the walls, updated every light fixture, totally overhauled the kitchen, renovated the bathroom, and even knocked out a wall. We couldn’t have done it without SO much help. We especially need to thank Carpet Exchange who generously donated all of the flooring and installation. We are beyond grateful for this incredibly generous donation. It truly changed everything for us. We are seriously obsessed with our new office. So next time you are in Boulder, please stop by and see it. Our other big update: we have new team members! We filled both of our full-time positions. Woohoo! We are so excited to add more talent to the Celebrate team. We will do profiles on them here soon. This year we were honored to receive funding from 2 new national partners, Ewing Marion Kauffman Foundation and Chick-fil-A Foundation. In October, we received word that we were chosen as a grantee of the Inclusion Open initiative. The grantees were selected after demonstrating that they have helped entrepreneurs meet challenges in areas such as developing business models, obtaining funding and building management teams. 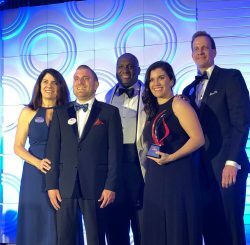 We are thrilled to be included in the incredible group of organizations working to level the playing field for entrepreneurs. 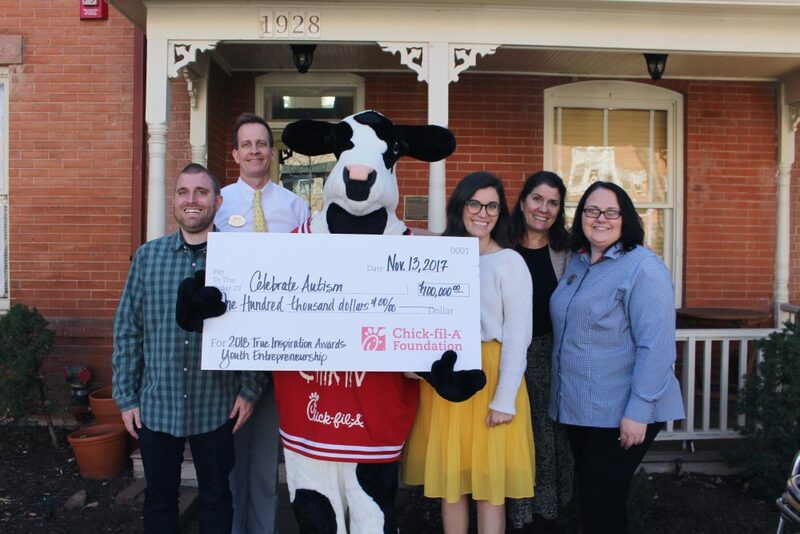 Additionally, we were surprised by the Chick-fil-A Foundation in November when they showed up with the cow, a team of people, and a giant check representing that we are the winner of the 2018 True Inspiration Award in Youth Entrepreneurship. It was truly a day to remember and we are looking forward to attending the gala in May! These partners will allow us to grow our programs nationally in 2018. We look forward to growing our impact thanks to the support of these 2 incredible organizations. Stay tuned! Over the past few months, we have worked closely with the team at MTN Creative to help us more easily explain what we do at Celebrate EDU. We needed to ensure that the message we share is consistent with our programs and our beliefs. So after a lot of time and effort, we are unveiling our new slogan (drumroll please) . . . These 3 words represent what Celebrate EDU programs do: Empower self-advocates to discover their dreams, embrace their interests and strengths, and create opportunities for the future. The other change you may notice is that we are replacing the term “people with disabilities” with “self-advocates.” A self-advocate is a person who takes control of his or her own life, using supports when needed. We believe that this term is a much better description of our program participants. You can read more about self-advocacy here. We look forward to sharing more of the AWESOME stuff we have been working on very soon! I walked into SEED SPOT Phoenix on September 14, 2013 (to be exact) with an idea for an organization and a lot of nervous energy. I had never taken a business class before and was terrified of the idea of pitching my business idea to a community audience each and every week. 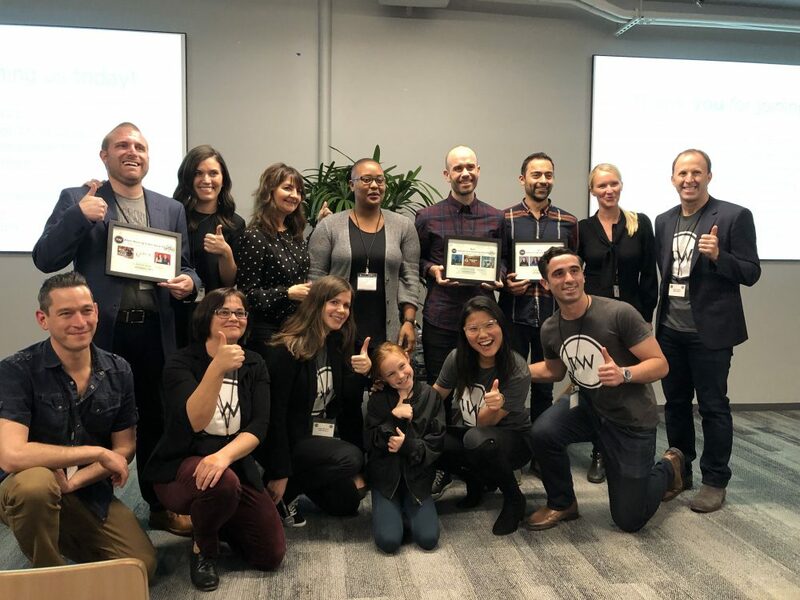 Throughout my 12-weeks in the program, I grew leaps and bounds as an entrepreneur and left with a solid business idea, incredible mentors (including one still on our board today) and a $25,000 seed grant from the Pakis Family Foundation. The rest, as they say, is history. We are excited to announce that we have a new in-kind donor for our Kindling Entrepreneur Workshops! 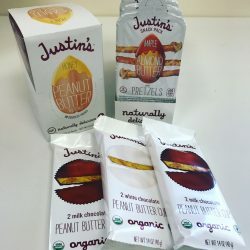 The Boulder-based company, Justin’s, will now sponsor the “afternoon snacks” provided to students who attend our 1-day entrepreneurship workshops. What better way to refuel than with healthy nut butter and snack packs? We are so thrilled to call them a partner and are already enjoying the delicious snacks they have provided. Thank you, Justin’s! p.s. 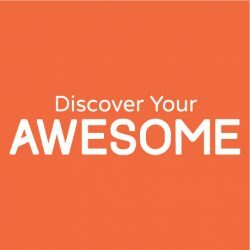 Did you know that Justin is also a super cool entrepreneur? Be sure to check out his founding story by clicking here.